The world of electricity is filled with acronyms and abbreviations – CFL (compact florescent lamp), kW (kilowatt), AC (alternating current), and POV (peak operating voltage). GFCI (ground fault circuit interrupters) and AFCI (arc fault circuit interrupters) are also common electrical abbreviations. They both help protect your outlets from electrical accidents. Ground fault circuit interrupters help prevent burns, electric shocks, and electrocution. A GFCI has sensors that measure the current going in and out. Normally, the current is balanced. However, if the current is out of balance, something is wrong. The electric current has made contact with a human or somewhere else it should not be. The GFCI senses this and instantly shuts down the circuit, stopping the flow of electricity. 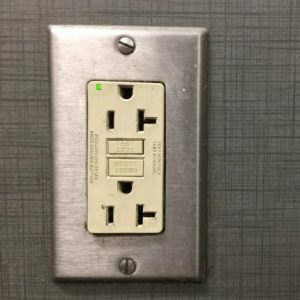 Since water is an electric conductor, GFCIs are important in areas where water and electricity could meet, such as bathrooms, kitchens, laundry rooms, and garages. Arc fault circuit interrupters help prevent electric fires. Electricity can leak out of damaged or decaying wires and start a fire. These fires spread quickly in the wiring behind walls. Electric fires cause more damage than some other types of fire and are twice as deadly. AFCIs sense electricity is leaking from the electric system and shut electricity off before overheating happens.